1963 was an important year for the actor, called to Spain to play the leading role in one of the most scathing works in its criticism of the social conventions of that country, directed by Luis Berlanga, EL VERDUGO/LA BALLATA DEL BOIA (THE BALLAD OF THE HANGMAN), and in Italy to appear in LA PARMIGIANA (THE GIRL FROM PARMA). 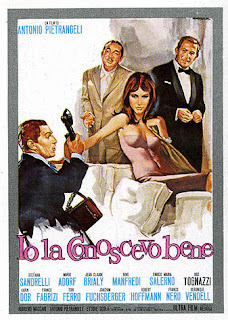 The latter was a free adaptation of the novel by Bruna Piatti, written by Piatti, Stafano Strucchi, Maccari, Scola and the director, who was Antonio Pietrangeli. Dora (Belgian actress Catherine Spaak) was a girl who ran away from the Romagna village where she lived with her uncle, a priest, and landed in Parma, where she is torn between an overbearing and vulgar lover and an aspiring, but boring fiance. This Dora, who lets herself go and squander her life without the moral force to make choices has felt a true attraction only for Nino (Manfredi), a small-time swindler, who has even ended up in jail, and makes ends meet as a publicity agent. So she leaves Parma and goes to Rome to be with him, only to discover that he is happily living with another woman. In motion pictures that are often too "Roman", the film has the merit of placing the action in Romagna and of treating ironically the conventions and morals of provincial Italy without assuming a moralistic tone. Manfredi, with his characteristic restraint, acts the part of an ambiguous figure, neither good nor good-for-nothing. He gives the lucid portrayal of another ambiguous publicity agent in Pietrangeli's best film, IO LA CONOSCEVO BENE (I KNEW HER WELL: 1965), another portrait of a woman who lets herself go, model, then starlet in mythological films, mistress of this man or that, in the end a suicide. Here Italian-style comedy touches its limit and trespasses into the normal dramatic film, always sustained, however, by zones of irony, by gags and intervals of smiles.